Yesterday I wrote about the hike I did. The temperatures ranged from about 45° when I started to about 53° when I ended (that’s 7° and 12° for non-usans). My feet were perfectly comfortable the whole time. Now is a very good time to start acclimating your feet to cooler temperatures. Believe me when I tell you that they will respond. Not only that, but a fall hike is probably one of the best ways to start to get them used to colder temperatures. First of all, while the air temperature may be cooler, the ground itself is still quite warm, so you won’t be overstressing your bare feet. Secondly, when you are hiking, all the muscles and tendons and ligaments in your feet will be helping to pump plenty of warm blood down there. And finally, exposing your feet to the slightly cooler temperatures will slowly accustom them to those temperatures, and you will very quickly discover that you can go out barefooted and comfortable in temperatures you never dreamed possible. I do a lot of hiking, and today was just so gorgeous . . . 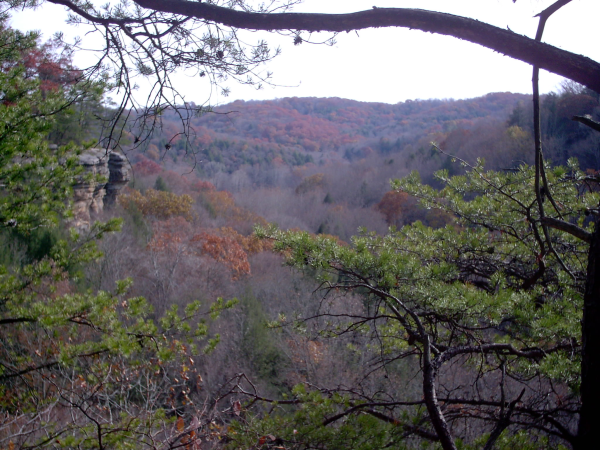 I ended up going to Hocking Hills, and decided to do a bit of bushwhacking around. If you are not familiar with the area, there a a bunch of really nice sandstone cliffs, make up of what is called “Blackhand Sandstone.” This sandstone is well-cemented near the top, and well-cemented about 100 feet lower down, but the stuff in the middle is rather crumbly. 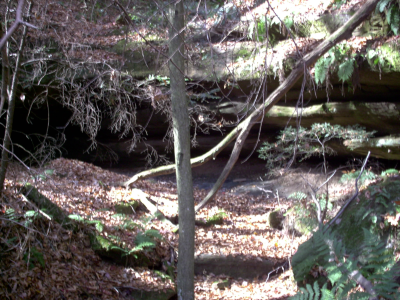 So a lot of what are called “recess caves” are formed, and they are the main feature of Hocking Hills. I started out parking at Conkles Hollow State Nature Preserve and walked along the west rim to get to where I was headed: Burgoon Hollow. I bushwhacked down into the Hollow, taking pictures of just what the formations were (I’d never been there before). The cool thing about doing it barefooted (aside from all the usual benefits) is when one has to climb back out. That’s were toes come in extremely handily. The hollow walls are pretty step, and toes are just perfect for grabbing into the soil for a very good grip. Just goes to show: bare feet are just fine for all sorts of hiking.